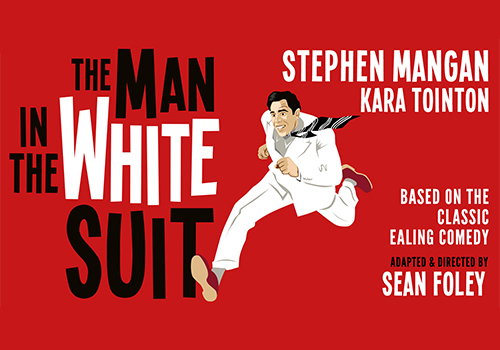 Classic comedy film The Man in the White Suit is to be adapted into a play starring Kara Tointon and Stephen Mangan this autumn at the Wyndham’s Theatre London. The Man in the White Suit is based on the 1951 comedy film of the same name made by Ealing Studios which starred Joan Greenwood, Alec Guinness, and Cecil Parker. This brand new stage adaptation will play for a limited engagement at Theatre Royal Bath before transferring to Wyndham’s Theatre London this autumn. A fourteen-strong cast will come together for this hilarious new show, and an original score has been specially written for the piece. When Sidney Stratton accidentally invents a new fabric which never gets dirty or wears out, everyone hails him a genius. That’s until manufacturers and trade unions realise it could put them out of business fast. While Sidney is outcast by the town, only Daphne the mill owner’s daughter shows him any sympathy. As his world gradually falls apart, Sidney finally finds love and a brand new idea. Stephen Mangan stars as Sidney Stratton. Mangan is best known for his work in Jeeves and Wooster and for the TV series Green Wing. His recent stage credits include The Birthday Party and The Norman Conquests, for which he received a Tony Award nomination. Kara Tointon will play Daphne. Tointon is perhaps best known for playing Dawn Swann in Eastenders. Her stage credits include Eliza in Pygmalion, Olivia in Twelfth Night at the RSC, and as Maria in the live TV musical The Sound of Music. Sean Foley adapts and directs The Man in the White Suit. An Olivier Award winner, Foley has previously directed Mangan in Jeeves and Wooster as well as directed the X-Factor musical I Can’t Sing! In 2012 he was nominated twice for his production of The Ladykillers, also based on an Ealing comedy film. Set and costume design comes from Michael Taylor. The Man in the White Suit is set to be a hilarious, fast-paced comedy based on a well-loved film. The Man in the White Suit at Wyndham’s Theatre London will open on September 26th, with an official opening night on October 8th. note: Stephen Mangan will not be appearing for the entirety of the week commencing 23rd December. The age recommendation of The Man in the White Suit is to be announced.